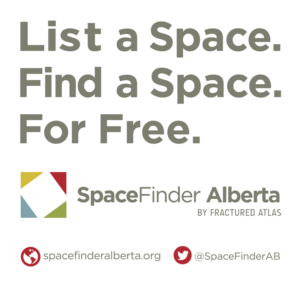 Calgary Arts Development’s arts space activities include seeking opportunities for arts space creation with community stakeholders and The City of Calgary, SpaceFinder Alberta, as well as gathering and sharing knowledge and expertise. We are pleased to share links to external resources. If you know of any helpful resources that should be included here, please email Amy Jo Espetveidt at amyjo.espetveidt@calgaryartsdevelopment.com. Not-for-profit urban development organization in Toronto that works with developers to integrate artistic and creative spaces and hubs in their projects. ArtsBuild Ontario is a not-for-profit organization whose mission is to address the cultural infrastructure challenge facing Ontario’s charitable small and midsized performing and visual arts organizations. The Creative City Network of Canada (CCNC) is a national-non profit organization made up of municipalities, arts organizations and individuals working to support cultural development in their communities. Through spaces, consultation and exchange programs in Hamilton, Cobalt Connects develops innovative facilities, projects and partnerships that advance the creative community. Creators of the King Edward Arts Incubator, cSPACE connects creative people and ideas through places in Calgary that ignite community, collaboration and change. Applications currently closed. The Cultural Space Investment Process (CSIP) is a capital project evaluation process established by Calgary Arts Development to inform City Council and the municipality of priorities for community-led, cultural infrastructure projects. Funding assistance can be requested for a planning study, capital project or equipment, combination of a study and/or capital project, or special needs (i.e., disaster funding requests within Alberta). The Community Initiatives Program (CIP) funds projects that enhance and enrich communities throughout Alberta. Project-Based Grant provides assistance to community organizations for such projects as equipment purchases, facility construction or renovation projects, hosting/travel/special events, and new programs or special funding (i.e., disaster) requests. The Community Initiatives Program (CIP) Operating Grants provide assistance to registered nonprofit organizations by delivering ongoing programs and services to the community, and enhancing the organization’s ability to operate. The Canada Cultural Spaces Fund (CCSF) supports the improvement of physical conditions for artistic creativity and innovation. The fund supports the improvement, renovation and construction of arts and heritage facilities, as well as the acquisition of specialized equipment. As of May 1, 2016, public art and feasibility studies are now eligible for support under the fund. Although applications for CSIP are currently closed, this PDF of the CSIP application form asks for standard information proponents should know about their project. This self-assessment checklist was created in collaboration with the Vancouver arts and cultural community as part of the development of the 2008 – 2023 Cultural Facility Priorities Plan. Based on Artscape’s experience, Planning for Cultural Facilities: How Planning Tools and Incentives Can Support Cultural Infrastructure Development is intended as a guide and resource to assist with navigating the complex landscape of legislation, planning frameworks, fiscal tools, and incentives that must be understood and leveraged in order to gain support, funding, and approval for the development of cultural infrastructure. A one-stop destination for all things related to building, managing, greening, and financing arts facilities. Fully revised and updated in 2011, Square Feet answers the questions Artscape hears most often. A guide developed by the Federation of Calgary Communities in consultation with the City of Calgary. This PDF is a resource for non-profit co-location initiatives. The Nonprofit Centers Network Canada’s Shared Spaces Learning Series initiative is designed to contribute to the emerging national conversation about the roles, capacities and limitations of shared spaces, understood in various contexts as Community Hubs, Social Purpose Real Estate, and Non-profit Centres. These strategies and plans are listed from most recent and all include information pertinent to arts spaces in Calgary. The City of Calgary has developed this comprehensive strategy to improve the public spaces around City Hall, Olympic Plaza, and the new Central Library. Click on your neighbourhood to see the list of This is My Neighbourhood improvement projects chosen in partnership with our 14 participating communities. Action Plan connects The City’s day-to-day operations with long-term plans, citizen engagement, performance measurement and reporting, trends, our long range plans and, of course, Council Priorities. Infrastructure Investment Plans for Culture, Parks, Recreation and Emergency Response. Infrastructure Investment Plans for Culture, Parks, Recreation (CPRIIP) and Emergency Response. Recreation at The City of Calgary monitors and responds to changing trends and the evolving recreation needs of Calgarians. The City has been evaluating proposed developments and directing growth using the Municipal Development Plan since 2009. The Calgary Heritage Strategy presents a new vision for historic preservation for the City of Calgary. The 2015 Centre City Citizen Perception Survey findings continue to demonstrate that great strides have been made in building a vibrant Centre City. imagineCALGARY is an award winning initiative that represents the voice of 18,000 Calgarians. Together, we created a shared vision for our city and a detailed plan for how to get there. The Open Space Plan has been developed to provide a single, comprehensive and integrated source of policy on open space, and an up-to-date vision that provides cohesive direction for the system as a whole. Many City policies pertinent to arts spaces are listed below. More City of Calgary policies can be found at calgary.ca. Fair Calgary will look at the broad context of fairness and sustainability with all marginalized groups, while the Corporate Accessibility Policy focuses on access and people with disabilities. To facilitate the long-term sustainability of community groups that hold a lease or license of occupation with The City of Calgary through the provision of a capital grant program that enhances and maintains community—operated facilities for citizens to participate in healthy, active and creative lifestyles. The following Principles establish the basis for the relationship between The City of Calgary, its residents and its employees in the development and implementation of its policies, programs, services, facilities and public spaces. The policy outlines a blueprint for enhancing the lives of immigrants in Calgary by identifying ways in which The City of Calgary could better serve their distinct needs. This Policy and framework cover all not for profit relationships that enter into an agreement with The City for services that Council has deemed worthy of public support. To ensure civic leadership and investment in the arts has a clear and measurable impact on the aesthetic, social, economic and cultural quality of life in Calgary. The Festival and Event Policy serves as the guiding document to direct the management, maintenance and growth of vibrant Festivals and Events that provide maximum benefit for The City and its citizens. The Policy provides guidance and direction to Administration, community associations, social recreation organizations and citizens on the value and 2 ISC: Unrestricted benefits of partnerships and the shared responsibility in delivering quality community-oriented services to Calgarians through the leasing or licensing of public lands. The Public Art Policy provides cultural leadership and guides the evolution of a distinct and vibrant artistic character for the city’s public places. These guidelines apply to Civic Partners including Community Associations and Social Recreation Organizations who have Lease or License agreements on City-owned land and facilities which are under their control or operation. Building on our energy an Economic Strategy for Calgary. Who is BOMA Calgary? We’re the pulse of Calgary’s commercial real estate industry. Calgary Real Estate Board (CREB) is a cooperative association supporting Calgary and area’s 5,200 realtors. The online home of Colliers International Calgary, the heart of the New West. Monthly Market Reports delivered directly to your email. The Cultural Facilities Priorities Plan provides the City of Vancouver, the community, government and private partners with a new approach to cultural facility development that reflects the aspirations of a 21st century creative city. Produced by the Calgary Chamber of Voluntary Organizations, this report lays the foundation for increased collaboration in the voluntary sector.